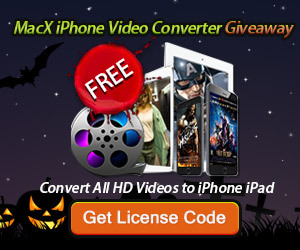 MacXDVD today launches a big Halloween giveaway of MacX iPhone Video Converter with no quantity limitation. From now to November 5th, 2014, any user can gain this useful Mac Video Converter for iPhone 6 on Halloween giveaway page without any cost. Also users have a chance to win an iPhone 6 for free during the MacXDVD Halloween promotion. MacXDVD Software today announces a 16-day Halloween giveaway of its flagship MacX iPhone Video Converter for users to convert standard/high definition horror videos to MP4, MOV, M4V, etc friendly for playback on iPhone, iPad, Apple TV and iTunes. Valid before November 5th, 2014, anyone can visit MacXDVD 2014 Halloween giveaway page and win this practical iPhone 6 Video Converter software with nary a penny. And the user who has shared this 2014 Halloween deal to Facebook or Twitter, is qualified to join the activity of “Win A Free iPhone 6” and has an opportunity to take the gratis iPhone 6 home. Halloween is not only the festival for Halloween costume party, trick or treat games, but also a big day for deal seekers to catch now-or-never giveaways and stack ultra-discounted products. The 2014 MacXDVD Halloween deal is the very one consisting of the once-in-a-blue-moon giveaway and numerous cutting-edge products with a big price cut as follows. The 2014 MacXDVD Halloween giveaway pushes out the highly-acclaimed MacX iPhone Video Converter as Halloween gift. This best-ever video converter for iPhone enables users to flawlessly convert any SD or HD video to iPhone iPad playable video format on Mac (Yosemite), including MP4, MOV, M4V, AVI, FLV, MKV, etc. Plus, it works seamlessly with iPhone 6/6 Plus/5S/5/C, iPad Air 2/mini 3, Apple TV, iTunes, etc. so that users can play any Halloween-themed movie/video on any generation of Apple devices. As another important part of this special offer, the Halloween discounted software includes MacX DVD Ripper Pro , MacX Video Converter Pro, MacX Halloween Gift Pack and MacX DVD Video Converter Pack, with up to 10 dollars price off. And it’s mentionable that MacX Halloween Gift Pack (MacX DVD Ripper Pro, MacX Video Converter Pro and Air Playit Streamer included) not only allows users to rip DVD movies, convert video to readable formats and stream video to iPhone iPad with 10 dollars cut down, but also supports users to recover deleted data and transfer data between iPhone iPad and Mac with bonus gifts Disk Drill Pro and MacX iPhone Mounter. To push 2014 Halloween fever to a new high, MacXDVD presents one iPhone 6 as Halloween gift for MacXDVD Halloween giveaway participants. To be the lucky dog to take iPhone 6 home, users just need to share this MacXDVD Halloween special offer to Facebook or Twitter and then submit E-mail. Then the qualified users have a chance to be the owner of iPhone 6. The MacXDVD Halloween revelry lasts from Oct.21 to Nov.5, 2014, during which every customer is able to obtain MacX iPhone Video Converter each worth $39.95 for no additional cost. More detailed information about other discounted software please remain focused on MacXDVD 2014 Halloween giveaway.